I have more than just a homemade hummingbird nectar recipe, check out more recipes at the end of the page. Making nectar is simple and so rewarding. I love watching them, as most people do. 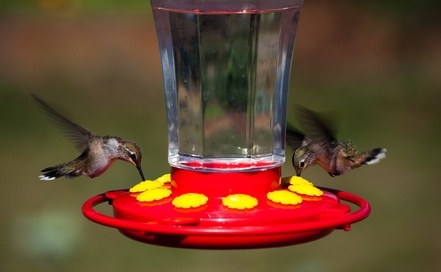 Help them out by making your own homemade hummingbird food (no preservatives). I do not color the sugar water because it is harmful to the birds. I choose to purchase a red feeder. No food coloring needed. Boil water and add sugar. Stir until sugar dissolves. Cool and fill the feeder. PREHEAT the oven to 350 degrees and you need three 9" cake pans; greased well and floured. Sift together flour, sugar, salt, soda and cinnamon. Add eggs, and oil and stir. Stir in vanilla, pineapple, bananas and pecans. Spoon batter into 3 well greased and floured 9 inch cake pans. Combine all ingredients until fluffy, frost cake and garnish as desired.